Big Data is the process where very large volumes of data are captured in various velocities and in many different formats for data analysis and knowledge discovery. Big data is a paradigm shift in the ways we find new value in a variety of data, both within and outside conventional data sources. SoftSource is positioned to help organizations prepare for big data implementation, providing a range of solutions from big data storage to analytics and business intelligence. Tableau business intelligence helps people see and understand data by providing fast, easy to use, highly visual, and interactive analysis of their data. Using Tableau, non-technical users can rapidly and easily connect to a wide variety of data sources without requiring IT support to analyze their data. Tableau’s drag-and-drop query feature also allows users to explore a wide variety of their data easily compared to traditional database queries and Excel. Why do people use Tableau? 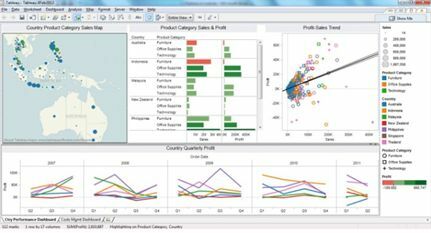 With SoftSource, you can explore Tableau with confidence…. Download a trial copy now or contact us for more information on how Tableau can help you.